Learn German verbs with effective exercises. You learn words from common situations and expand your vocabulary with other common verbs. Effective German exercises let you practice thousands of German verbs in the infinitive. Practice complete conjugations and learn irregularities. You practice the principal parts of all German type verbs and learn how to conjugate all verbs of modern German. Learn the German verbs you need to speak fluently. You practice the basic forms of verbs (the infinitive), their declensions and principal parts. All unique declensions in modern German are included in Langbird. To learn a language really well, you must practice. Langbird contains the vocabulary and the structures that modern research shows you need to know to speak German fluently. When you learn German, you need to know the conjugation of verbs. The perfect tense is formed with "haben" or "sein"
The Langbird vocabulary is divided into topics and levels. Topics correspond to everyday situations. Levels correspond to how common a certain word or phenomenon is in German. There are in total seventeen levels ranging from A1 to E. Every level contains sentences, grammar and about 500 unique word families. When you have managed between ten and sixteen levels, you start getting fluent in German. A Langbird level consists of many chapters and each chapter in turn consists of many exercises. Chapters and exercises are short so you can complete them quickly. How fast you go depends on your own results. The pace is speeded up for topics you already master, and slows down oif you make mistakes and need more time. Langbird is designed to be easy to use for absolute beginners as well as advanced university-level users. 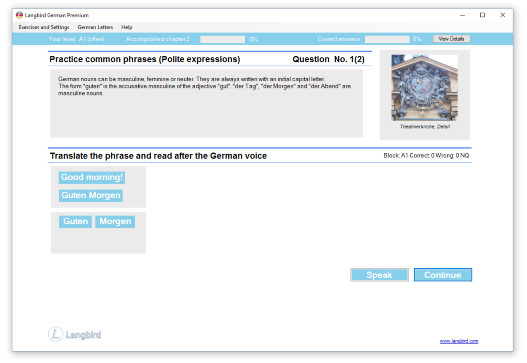 Practice with fast, simple exercises where you click on alternativa answers, or practice written and spoken German and write answers. Follow your results in real-time with the results monitor. Skip chapters and levels and repeat chapters as you wish by clicking selecting chapters or levels on the Langbird playing field.